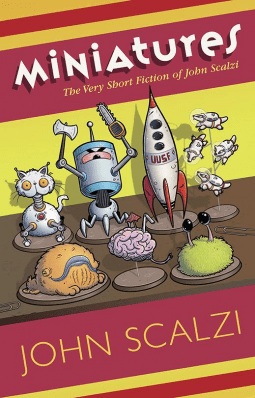 Miniatures is a collection of Scalzi’s very short fiction, plus one poem. Most of it is humorous, and if you’re au fait with Scalzi’s humour then you know what to expect. It’s more or less like reading his twitter feed — in fact, two of the stories come from his twitter feed. They’re funny because they treat aliens as routine, there’s fart humour (if you find that funny), etc. It’s a fun collection, but not exactly satisfying: the stories here aren’t anything deep and meaningful. There are some fun ideas (I’m intrigued by the alien animal which made people depressed, for example), and if you’re a big fan, you probably will want to pick it up. The poem isn’t even terrible. Most of these pieces aren’t really available anywhere else, either. I have an ARC of this on my tbr. I have to say, I don’t often find “super short stories” to be satisfying either, and my eyebrows are already raising in skepticism at the idea of twitter tales and poems. But the eclectic nature of it does sound like it could be fun! They can be well done, but… I tend to prefer my super-short-stories rather artsier than this. These were, well, prosaic. Oh well!